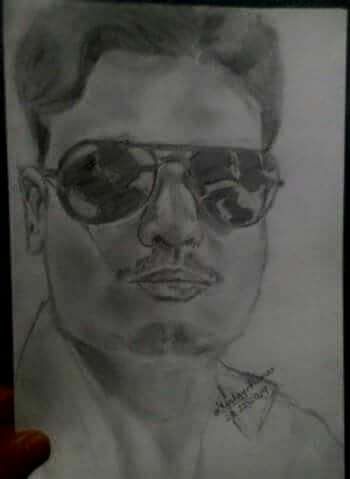 Pencil sketch of Binit Kumar Roy from Bhagalpur, Bihar by Akshay Kumar. This pencil sketch portrait was requested by Binit Kumar Roy on my Facebook profile in 2014. The reference picture was the profile photo of Binit Kumar Roy. It had taken 4 hours for me to be draw. this sketch from photo. Much time was consumed in giving a realistic look to the sketch. Especially drawing the goggles and the reflection was not easy for a newbie like me. But somehow it came out good. This pencil drawing was made only using a simple HB pencil and an A4 Drawing sheet.